A group of high school students has written an ebook to help steer their same-age peers toward safe practices. 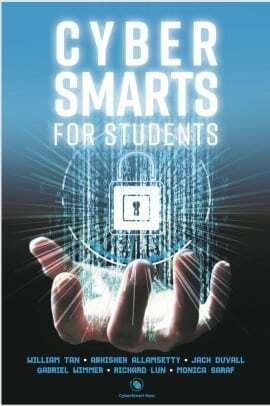 Thomas Jefferson High School for Science and Technology students Abhishek Allamsetty, Jack Duvall, Richard Lun, Monica Saraf, William Tan and Gabriel Wimmer worked on “Cyber Smarts for Students” through their nonprofit CyberSmart Now. The organization aims to educate middle school and high school students on safe internet use through classes, publications and other activities. The book’s 12 chapters cover a range of topics including protecting data while traveling, creating strong passwords, managing backup systems, remote access security, cyberbullying, safe online shopping, phishing, scamming, security issues around internet of things, and related topics. The book also points readers to additional resources, such as cyberbullying.org/report, where users can report bullying behavior. The group members spent a couple of months working on the book and compiling their collective knowledge and experience. Each member has been a finalist in CyberPatriot’s cybersecurity competitions, and Saraf and Tan were 2015 champions. The group is working to introduce the book and the ideas in it to a broader range of students by making presentations at parent-teacher associations, school boards and others connected with teens. Each of the CyberSmart Now students is interested in computer science as a career field after college.